SPINDLERUV MLYN, Czech Republic — Mikaela Shiffrin closed in on her first women's World Cup giant slalom trophy Friday after placing third in the penultimate race of the season, which was won by world champion Petra Vlhova. Shiffrin leads her Slovakian rival by 97 points in the discipline standings with only one event remaining at next week's World Cup Finals in Soldeu, Andorra. A race win is worth 100 points. "I think there is still something possible at the finals so I won't celebrate yet. But I am really happy to have this kind of advantage," said Shiffrin, who has already successfully defended her overall and slalom titles. After three overall and six slalom championships, it would be the 10th career crystal globe and third of the season for Shiffrin, who is also in the hunt for the super-G title. "Slalom, overall and GS are my biggest goals this year so it's an incredible place to be right now," the American said. Vlhova built on her commanding first-run lead of nearly a half-second to beat Viktoria Rebensburg of Germany by 0.11 seconds. Shiffrin, who was 1.33 behind in fourth after the opening run, posted the fastest time in the final run and improved to third, 0.60 behind Vlhova. Tessa Worley of France, who was runner-up in the GS standings before the race, finished seventh to drop out of contention. 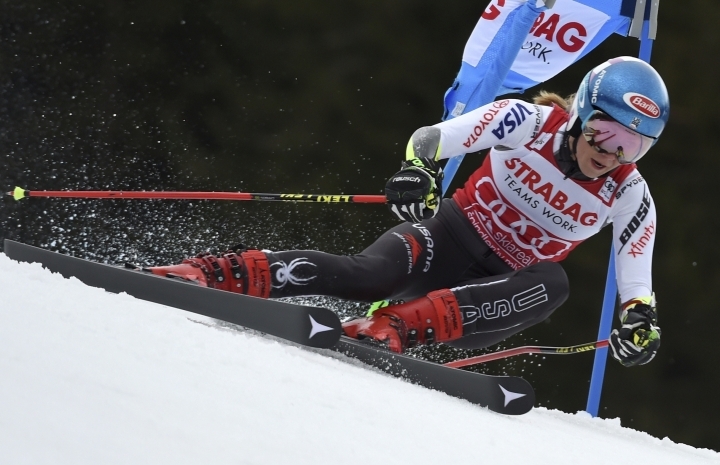 It was Shiffrin's first race in 17 days after sitting out events in Crans-Montana and Sochi to recharge following the world championships and a parallel city event in Sweden. Returning to the resort where she started her World Cup career at the age of 15 in 2011, Shiffrin struggled in the opening run. She started aggressively and led Vlhova by 0.13 at the first split time, but failed to find a smooth rhythm in the rest of her run and trailed by 1.33 in fourth. "When I saw the video (from the first run) I was pretty disappointed," Shiffrin said. "To compete with the best, with Vicky and Petra, I had to do better on everything." After finishing her second run well ahead of the competition, Shiffrin bent forward and briefly screamed for relief. 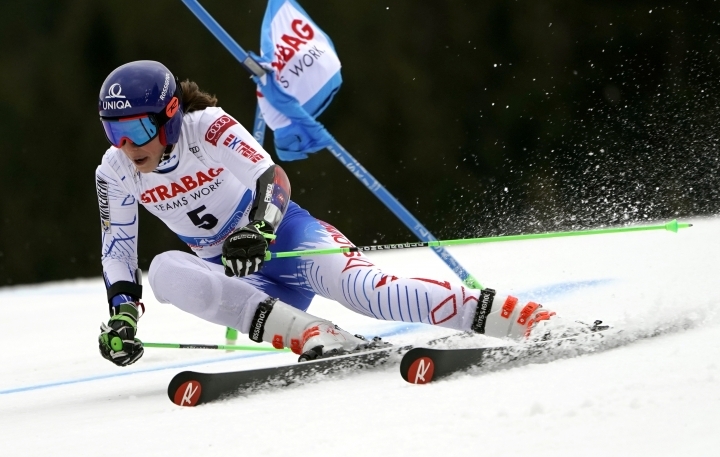 "The second run was much, much better so I am really happy with that," she said. "So happy to have a podium." Initially a slalom specialist, Vlhova has evolved into a leading giant slalom contender, winning her first World Cup races in the discipline in Semmering and Maribor this season. Vlhova added gold at last month's world championships, where she and Rebensburg finished 1-2. On Friday, Vlhova impressed in both runs with a strong recovery from a mistake. "I knew I did a big mistake but I had a really good feeling in the steep part," she said between runs. "In the last part I just let my skis go and I was really fast." Vlhova repeated the feat in the final run. 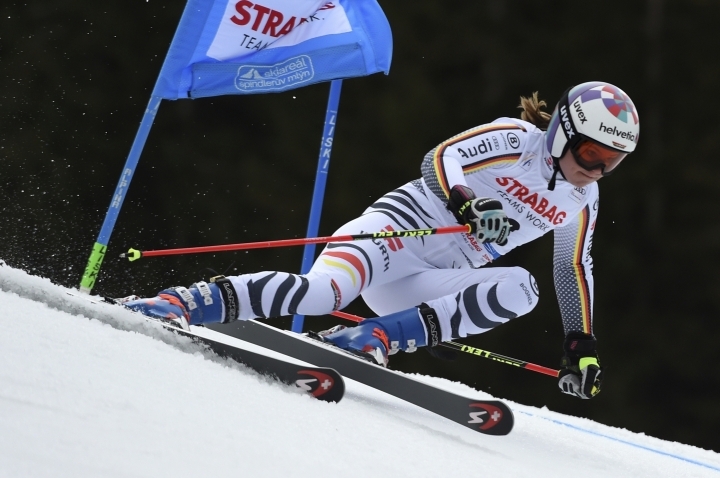 She quickly lost four-tenths of her advantage over Rebensburg and even trailed the former Olympic champion from Germany by 0.15 halfway through her run, but skied a solid bottom section to get the green light at the finish. "It was not easy but I did it and it's something amazing," said Vlhova, loudly cheered by many of her Slovakian fans. "It's something special because I feel like at home here. Those fans (are) something amazing."